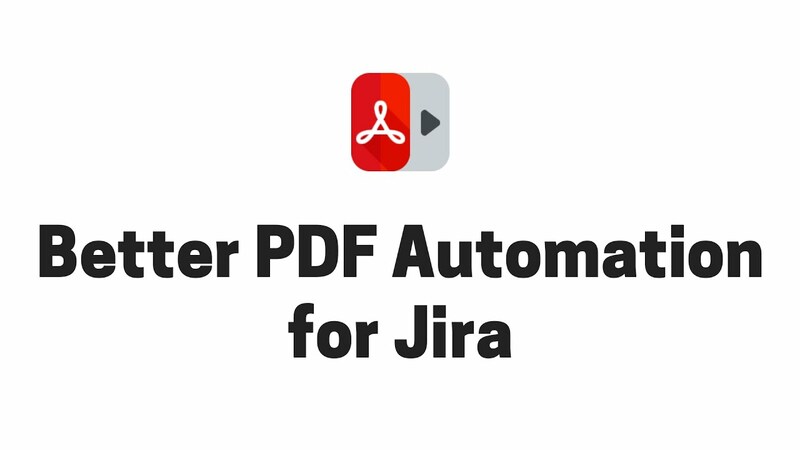 This app was previously called "PDF Automation Plugin for Jira". It is still the same app you love, but it was renamed in Sep 2018. A rule in a nutshell: if the trigger "happens", then the action is "executed". You can freely select from multiple triggers and multiple actions — all parametric. The Send PDF action enables you to select the PDF template, enter the recipients' email addresses, the email subject and the body text. All these configuration settings can be static or can use template variables (e.g. the assignee of the issue). Let the exports come to your mailbox automagically. Daily stand-up meeting at 9:00? Schedule Send PDF to 8:50 and auto-send the sprint status report to everyone involved. The Save PDF action saves the generated PDF files to the file system. Paths may be dynamically generated from the project's key, the issue's key, a timestamp, etc. Issue archiving could not be easier! Produce a human-readable, searchable archive of your issues. Create snapshots, baselines or backups with ease. The Attach PDF action attaches the generated PDF file to the "original owner" issue or to an arbitrary issue selected by a JQL search. The attachment filename is dynamically generated, therefore it can include the issue key, the timestamp, etc. Attach the snapshot to an issue in order to keep the historical state in Jira. Use these lightweight baselines for historical views, metric collection, comparisons or audits. Once you understand your options, it is a very powerful and flexible solution for rapid, repeatable, low-maintenance automation. Better PDF Exporter is really useful for automating the dashboard exports via email. This really saved a lot of manual efforts and time by sending the dashboards to the respective stakeholders in regular frequencies. Better PDF Exporter and Better PDF Automation allowed me to email PDFs to my clients automatically. Those contain key information about my projects, such as custom fields data and even screenshots of Google Maps dynamically integrated into my Jira issues! Simple and useful plugin that we use for scheduled reporting via email. Support for the plugin from Midori was great when we had questions or issues. We are using it for saving issues to PDF and directly attaching it to the same issue. The support is also very fast. Also automating the export of spreadsheet reports from Jira? Check out our Excel automation app!